PRAGUE? 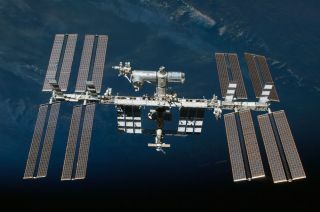 Astronauts at the International Space Stationspend nearly one-quarter of the time they allot to conductingexperiments torepairing or performing routine maintenance on the payload canistersthat housethe scientific gear, European and Japanese space station officials saidSept.29. Datais still preliminary, but indications are thatbetween 20 and 25 percent of the time astronautsdevote to scientific experiments is spent performingpreventive orcorrective maintenance on the payload racks. Morethan a year after the orbital complex reached itsfull permanent-crew complement of six astronauts, officials said theyhavenoticed the sharp increase in astronaut time given over toconducting the experiments that are one of the station'sprincipal reasonsfor being. Arecent call for proposals to use the station as aplatform for Earth observation sensors has yielded a large crop ofideas forwhat will be a new branch of science performed onboard. Russia'sFederal Space Agency space agency (also known asRoskosmos), which organizes the use of the Russian segment of thestation, hasa well-defined program of more than 170 experiments that should becompleted by2015, said Boris V. Zagreev of Russia's TSNiiMash organization. Zagreevtold the 61st International AstronauticalCongress here that 38 of these experiments have been completed, with 64more onboard the station and the remaining 70 on the ground in various stagesofprelaunch preparation. Ten new experiments are started on board eachyear, hesaid. Thestation's orbit does not permit it to view the wholeof Russian territory, making Earth observation a less-valuable area topursue,Zagreev said, making life sciences and fluid-physics experiments, alongwithexperiments on human physiology, the principal focus areas. He saidRoskosmosis still struggling with strategies on how to evaluate experiments thatwillmake the best use of astronauts' time and the spacestation's resources. Russiais adding new experiment space to the station thatby 2014 will bring to nine the number of modules ? 24 cubic meters ofvolume ?available for experiments. Roskosmos,he said, is concerned that too many experimentsbegun on the station are not brought to completion, for many reasons.He saidhe hoped the additionof new laboratory space will reduce the problem. Hedid not spell out the causes of the prematureabandonment of experiments. But a paper written by Nobuyoshi Fujimotoof theJapan Aerospace Exploration Agency said some 10 percent of astronauttime inthe Japanese experiment module is devoted to repairing experimentmodules. CarloMirra, space station mission integration manager atAstrium, a major space station contractor, said European astronautsspend 23percent of the time they devote to science experiments performingmaintenanceon experiment racks between experiment regimes, or repairing the racks. "Welive in the real world," Mirra said. "Thingswork, and things fail." He said an analysis of the rack-maintenance andrack-repair cycles gives no reason to believe that astronauts in thefuturewill be able to spend any less time on these chores. ESAhas performed 71 experiments between 2008 andmid-2010 and has seen "an incredible boost in utilization" of theexperiment capacity since the station's reached six permanent members,Mirrasaid. Mirraadded that he had not seen updated figures fromNASA but that the data from Japan appears to be similar to that of ESAand hewould be surprised if NASA's experiments required much less, or muchmore,astronaut upkeep.